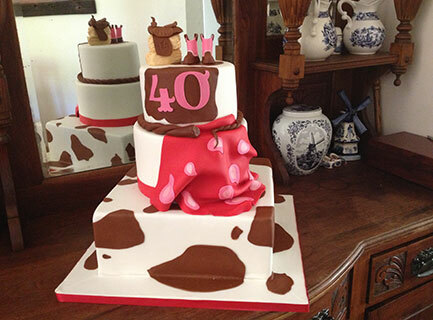 A 40th birthday celebration for a youthful lady who loves being a farmgirl. Cow's hide, a whip and bandana are some of the decorations and the finer detail includes a pair of cowboy boots in pink and saddle, all handcrafted. The cakes were a variety of flavours. Lovely to behold and delicious as always at Delightful Cake.